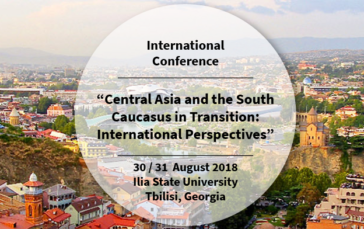 On 30/31 August 2018, the 3rd International EUCACIS Conference “Central Asia and the South Caucasus in Transition: International Perspectives” will take place at Ilia State University in Tbilisi, Georgia. Experts from the European Union, the South Caucasus and Central Asia will come together to discuss conflicts in the South Caucasus, take a close look at the latest events in Central Asia as well as explore possibilities for cooperation and dialogue between the European Union, the South Caucasus and Central Asia in three different panels. Following the conference, the 3rd PhD School will be held, where the 12 fellows discuss their PhD projects and receive detailed comments by EUCACIS team advisors and their peers to further develop their scientific and professional skills. The international high-ranking conference is the third conference of the PhD Programme EUCACIS for Postgraduates and Doctoral Researchers in Central Asia and the South Caucasus, which the IEP and the Centre international de formation européenne (CIFE) organise in close cooperation with the Ilia State University. The conference takes place within the framework of the PhD Support Programme “The EU, Central Asia and the Caucasus in the International System” (EUCACIS) for Postgraduates and Doctoral Researchers in Central Asia and the Southern Caucasus, organised by the IEP and CIFE. It is funded by the VolkswagenStiftung as well as the ERASMUS+ programme. Postgraduates who are working on their doctoral thesis in political sciences contemporary history or economics on a topic related to its thematic focus at a university or academy of sciences in the Southern Caucasus or Central Asia (including Afghanistan, the Kashmir region in India and the autonomous region Xinjiang in China) get a three-year scholarship and receive skill trainings and PhD schools. Please register here as soon as possible or at the latest by 26 August 2018.